Through her painting, Inka Essenhigh provides an authentic voice. Since her emergence into the art world during the late 1990’s, she has created a path for herself that consistently questions and redefines her relationship with her media. 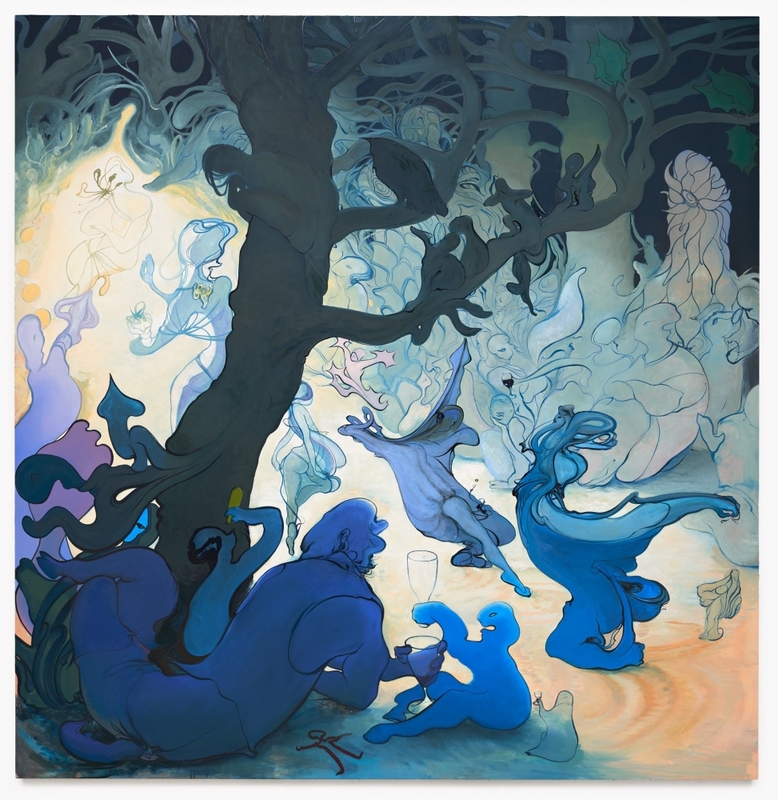 She has moved from using enamel paint to traditional oils and back; creating hybrids of the two. Her substrates have included paper, canvas, and panels. Throughout each phase of experimentation, she created dialogues with her work, navigating how the media and brush interact, sometimes with genuine surprise at the result. It is through this approach that Essenhigh’s dazzling works are borne. Her signature use of line follows her experimentation, keeping them grounded and giving them continuity. Swirls of light lead us up to a heavenly night sky. A yellow beanstalk makes a frenzied vertical climb, snagging a golden crown with blue jewel as it grows. Anthropomorphic condominiums break from their moorings. An old cemetery emerges from a hazy gloom. Each scene is vastly different, yet they all clearly belong to Essenhigh. Her elegant line defines space, rejecting the straight and embracing the curvy, the organic. They are fantastic visions rooted in the quotidian. The narratives find inspiration from her environs. Essenhigh spends time both in New York City and rural Maine. Both settings find their way into the artist's consciousness, becoming manifest in allegory. Ghosts and gods, monsters and maenads edge their way onto her picture plane. They are the forces that shape her world. Each painting and print is a moment of distilled vision and the emotions that accompany them. The full expression of a 21st century human; hope, anxiety, and everything in between. This exhibition will present 25-30 works from the range of mediums that the artist has explored. She gained early renown through her use of enamels and a process that included the use of automatic drawing to find her subject matter. Her evolution led her back into traditional oils and experiments in printmaking. Inka Essenhigh studied at the Columbus College of Art and Design in Ohio (1991) and the School of Visual Arts in New York (1992-1994). The public collections that hold her work include the Albright-Knox Art Gallery, Buffalo, NY; Denver Art Museum, Denver, CO; P.S.1 Center for Contemporary Art/ MoMA, New York, NY; Seattle Art Museum, Seattle, WA; Tate Gallery, London, England; Virginia Museum of Fine Art, Richmond, VA; the Smithsonian American Art Museum, DC; and the Whitney Museum of American Art, New York, NY. She is represented by Victoria Miro Gallery in London, and Miles McEnery in New York. She lives and works in New York City. Organized by the Virginia Museum of Contemporary Art. Curated by Heather Hakimzadeh. With lead support for the Capital Group Companies Charitable Foundation. Generous grants were provided by the City of Virginia Beach Arts and Humanities Commission, the Virginia Commission for the Arts, and the Business Consortium for Arts Support.